Metro services will be available for commuters at all stations but there will be no boarding and de-boarding facility at Central Secretariat and Udyog Bhawan Metro Stations from 5 am till 12 noon. Republic Day 2019 Parade Rehearsal: The full dress rehearsal for the Republic Day Parade 2019 will be held on Wednesday, January 23. Delhi Police has made elaborate traffic arrangements for smooth conduct of the parade along the route. According to an advisory released by the Delhi Police, the rehearsal will have the same route as that of the Parade on Republic Day on January 26. It will start at 9.50 am from Vijay Chowk and will proceed to the Red Fort. 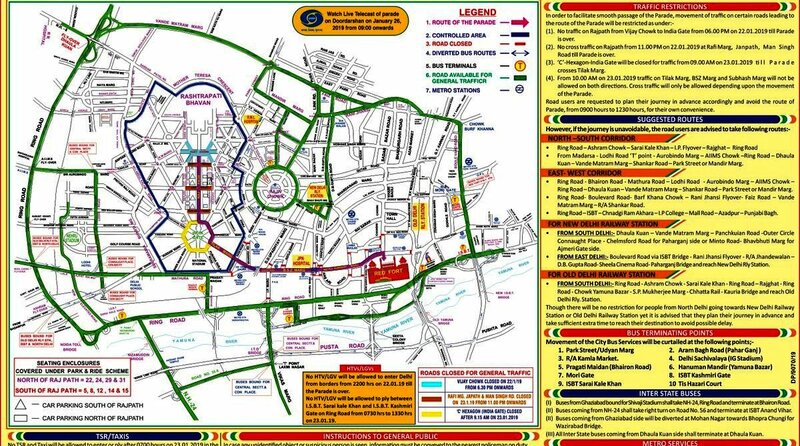 The Delhi Traffic Police has requested road users to plan their journey in advance and avoid the parade route from 9 am to 12.30 pm on 23 January..
No light goods and heavy transport vehicles will be allowed to enter Delhi from borders from 10 pm Tuesday, January 22, till the Parade is over. No light goods and heavy transport vehicle will be allowed to ply between ISBT Sarai Kale Khan and ISBT Kashmiri Gate on the Ring Road from 7.30 am to 1.30 pm on Wednesday, January 23. The Delhi Traffic Police has advised commuters to use the following routes if a journey is unavoidable. Those going to railway stations have been advised to keep sufficient extra time in hand to reach their destination to avoid any delay. * From Madarsa – Lodhi Road ‘T’ point – Aurobindo Marg – AIIMS Chowk –Ring Road – Dhaula Kuan – Vande Matram Marg – Shankar Road – Park Street or Mandir Marg. * Ring Road – Bhairon Road – Mathura Road – Lodhi Road – Aurobindo Marg – AIIMS Chowk – Ring Road – Dhaula Kuan – Vande Matram Marg – Shankar Road – Park Street or Mandir Marg. * Ring Road- Boulevard Road- Barf Khana Chowk – Rani Jhansi Flyover- Faiz Road – Vande Matram Marg – R/A Shankar Road. * Ring Road – ISBT – Chnadgi Ram Akhara – IP College – Mall Road – Azadpur – Punjabi Bagh. * From South Delhi:- Dhaula Kuan – Vande Matram Marg – Panchkuian Road -Outer Circle Connaught Place – Chelmsford Road for Paharganj side or Minto Road- Bhavbhuti Marg for Ajmeri Gate side. * From East Delhi:- Boulevard Road via ISBT Bridge – Rani Jhansi Flyover – R/A Jhandewalan – DB Gupta Road- Sheela Cinema Road- Paharganj Bridge and reach New Delhi Rly Station. * From South Delhi:- Ring Road – Ashram Chowk – Sarai Kale Khan – Ring Road – Rajghat – Ring Road – Chowk Yamuna Bazar – S.P. Mukherjee Marg – Chhatta Rail – Kauria Bridge and reach Old Delhi Rly. Station.